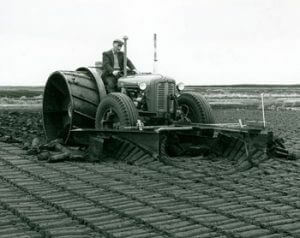 This attachment is used to form windrows of sod peat direct from the spread, when conditions are favourable. The attachment consists of two simple ploughs located in front of the tractor unit and braced to each other, while push arms extend from the rear of each plough to a point below the back axle of the tractor, where they are pin jointed to brackets inside the rear wheels. One plough is advanced ahead of the other, to avoid blockage by sods, between the ploughs. A complete windrow is formed between the ploughs, while half windrows are formed outside the tractor wheels. The tractor requires larger wheels to provide the necessary ground clearance to allow the formed windrow to be passed over by the tractor gearbox and back axle casings. The standard front wheels are replaced by the standard rear wheels and fabricated steel wheels are fitted on the back axle. The ploughs are made in aluminium or steel plate, the upper portion of the mould boards are vertical, the lower portion curved forward. The two mould boards are welded together at the front, resulting in a very pronounced point at ground level. The mould boards of each plough are braced to each other and an adjustable ground roller is fitted within them to control the critical position of the point in different bog conditions. 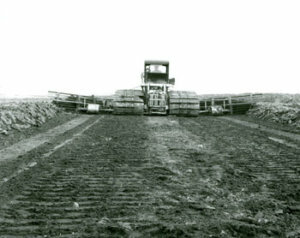 The cross bracing connecting the top of the two ploughs is fitted with a roller, which operates in a vertical guide fixed to the front of the tractor to control the side movement of the attachment. Side plates are fixed to the tractor, inside the push arms of the attachment, to control the position of sods still in motion, as the tractor passes over them. This avoids sods getting under the tractor wheels. Lifting ropes are attached to the plough cross bracing, passed over pulleys, which are mounted on a cross member at the top of the roller guide, and attached to the hydraulic lifting arms at the rear of the tractor. The ploughs can be lifted clear of the ground for idle travel. The purpose of this attachment (type 9) is to plough hand footed or mechanically windrowed peat into final rows spaced at 9 metres suitable for automatic harvesting into the rick. The attachment is a large “V” plough, the apex leading in front of the tractor unit while the plough shares run back outside the tracks of the tractor unit. It is constructed in standard steel sections. The plough shares are made up of a series of square hollow section steel with a 2″ (50.8 mm.) gap between them. The wings or shares are hinged to allow them to swing in towards the tractor for prolonged idle travel and transport. The attachment when working is supported by one roller at the front and by two small rollers on each side at the rear of the wings. For idle travel the attachment is lifted on hydraulics clear of the ground. The tractor requires larger wheels to provide the necessary ground clearance to allow the formed windrow to be passed over by the tractor gearbox and back axle casings. The standard front wheels are replaced by the standard rear wheels and fabricated steel wheels are fitted on the back axle. The ploughs are made in aluminium or steel plate, the upper portion of the mould boards are vertical, the lower portion curved forward. The two mould boards are welded together at the front, resulting in a very pronounced point at ground level. The mould boards of each plough are braced to each other and an adjustable ground roller is fitted within them to control the critical position of the point in different bog conditions. The cross bracing connecting the top of the two ploughs is fitted with a roller, which operates in a vertical guide fixed to the front of the tractor to control the side movement of the attachment. Lifting ropes are attached to the plough cross bracing, passed over pulleys, which are mounted on a cross-member at the top of the roller guide, and attached to the hydraulic lifting arms at the rear of the tractor. The ploughs can be lifted clear of the ground for idle travel.